Electrical Gloves are used for working on equipment which may or may not be live. These gloves provide protection against electric shock. They are usually made of rubber. Wires or sharp edges in equipment may puncture holes in the electrical gloves and seriously compromise insulation. Hence, a leather protective glove known as the overglove should always be worn over the electrical gloves for mechanical protection and safety against cuts or punctures Some electrical gloves have inner lining of cotton for comfort and to prevent irritation to the skin. It is important to ensure that the electrical gloves worn fit properly on the worker's hand. Hence, measurements of the hand need to be taken prior to ordering. Electrical Gloves have a specific voltage rating. The voltage rating of the gloves must be checked against the voltage of the equipment where the work is carried out. Ozone resistance in Electrical Gloves is indicated by Type I or Type II. Type I gloves do not have ozone resistance while Type II gloves are ozone resistant. The Gloves are provided along with a test certificate. All the gloves must be tested for insulation integrity once every six months. Gloves with even minor damages such as small holes or cuts should be immediately discarded. Gloves are tested for cuts and holes by an air inflation test. Air is blown into the gloves by a special device. 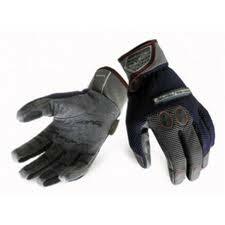 Cuts and holes in the gloves can thus be detected by means of the leakage of air. Besides, the gloves should be visually inspected every time before work. Gloves are an essential component of working with high voltage. Some people find gloves cumbersome and inconvenient. Nevertheless they are an important part of keeping oneself safe from electric shock, flash over or electrocution.